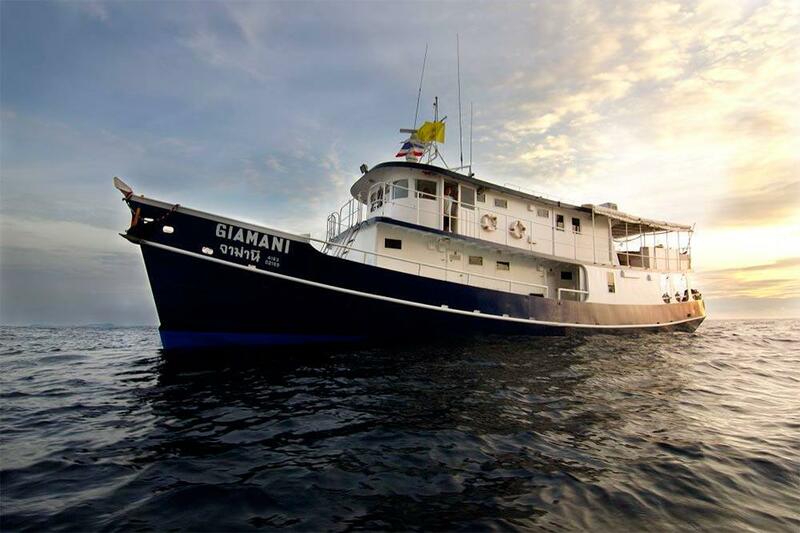 MV Giamani is a purpose-built diving liveaboard that has a great reputation for luxury, service, and a wide range of wonderful diving trips in Thailand. 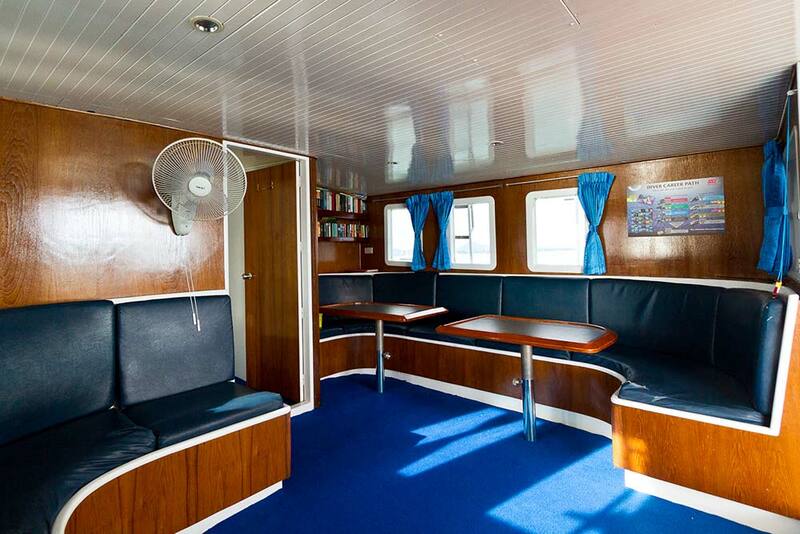 Although not the largest of luxury Similan liveaboard boats, MV Giamani has a huge appeal and for very good reason. 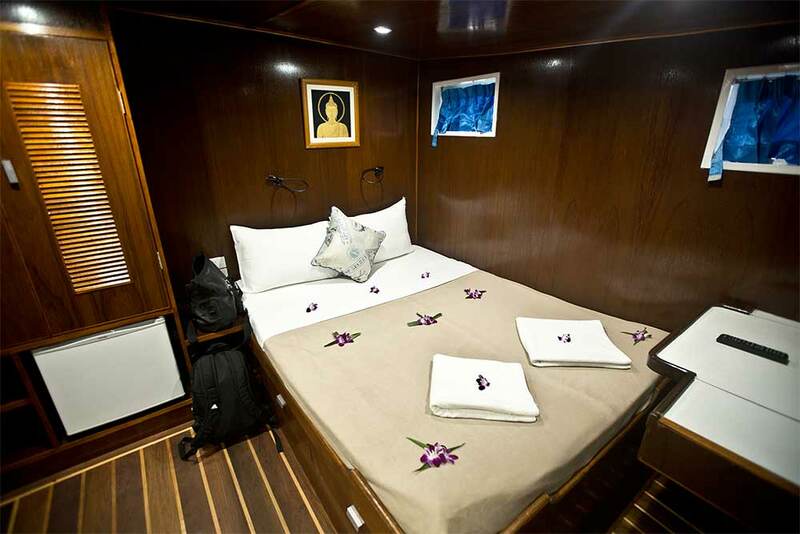 There are just five cabins on board, and each is extremely well equipped with en suite bathroom. The passenger limit is just ten lucky guests, and they enjoy the sociable and friendly atmosphere aboard, along with excellent service from the staff & crew. 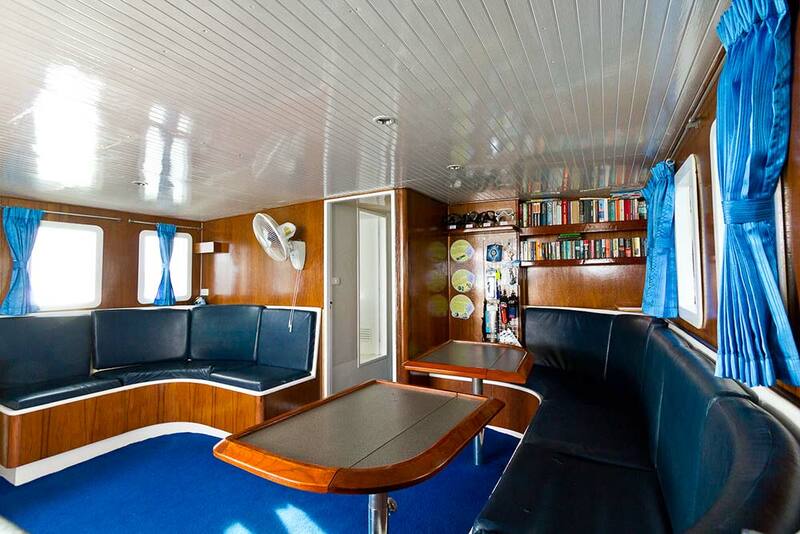 There are four deluxe cabins on the boat’s main deck. 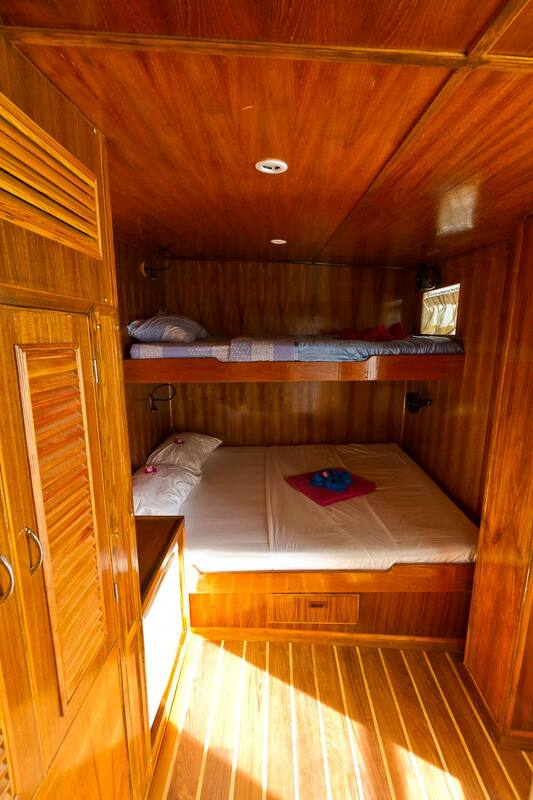 Each has a double and a single bed, making them ideal for couples as well as travelling friends. 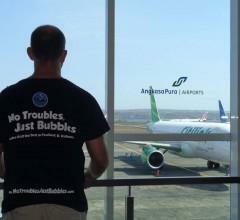 Even solo travelers can join the trips. On the upper deck, there is the new master cabin, which has a sofa, mini bar and unbeatable views of Thailand’s Andaman Sea. 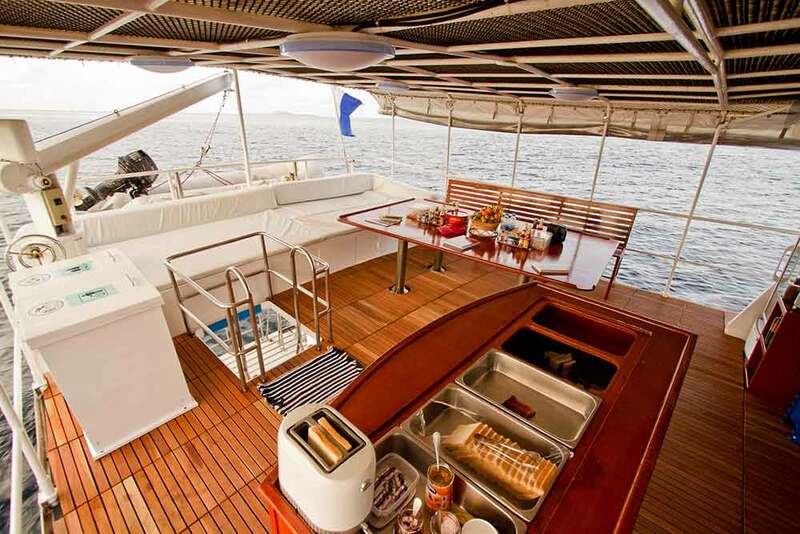 Luxury does not need to be on a huge boat, with twenty or more other guests. 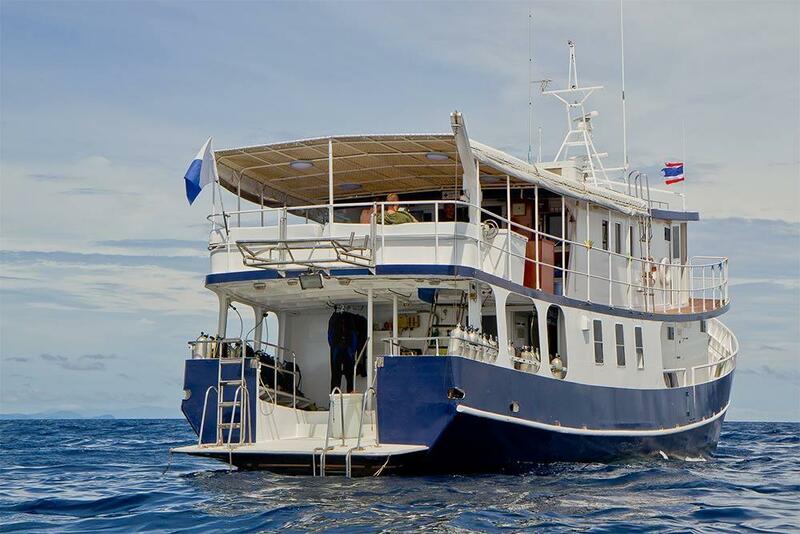 It can be enjoyed on a mid-size diving liveaboard, and at a reasonable price. 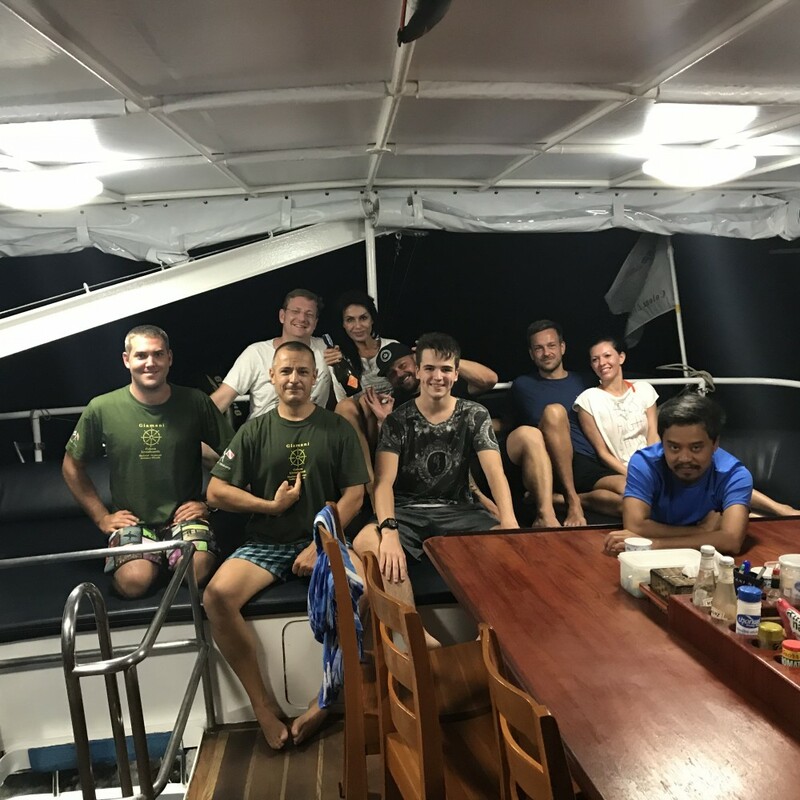 Another reason to choose MV Giamani for your diving cruise in Thailand is that trips alternate between The Similan Islands & Richelieu Rock (4D/4N), and Hin Daeng, Koh Haa & Koh Phi Phi (2D/2N). In fact, instead of choosing between these two wonderful options, many guests join both, and stay on board for nearly a whole week. Facilities on MV Giamani are all up to date and there to ensure that everyone enjoys a great time, in safety & comfort. 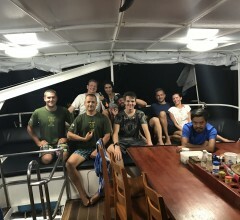 There are instructors on board to help and teach lower level divers, and there is Nitrox and other features for more experienced divers to fully enjoy the best diving opportunities in Thailand. 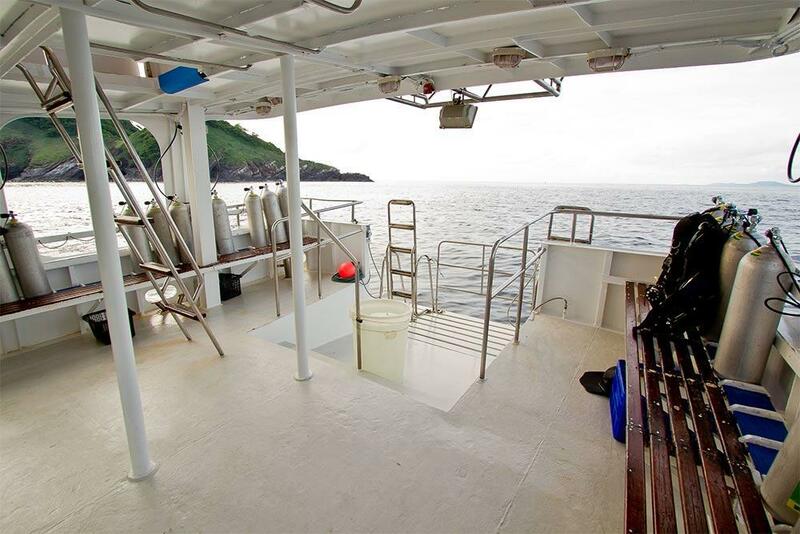 This includes technical diving and rebreather facilities. Finally, unlike most other Similan Islands liveaboard diving boats which transfer guests 100km by road to Tab Lamu Pier in Khao Lak, MV Giamani departs from Phuket’s Chalong Pier, this means that guests get to enjoy more time on board, sailing around Thailand’s crystal-clear tropical waters, rather than stuck in a hot minivan. And finally, unlike many other liveaboard boats which require 40%+ occupancy to confirm a trip, Giamani will sail with just two guests. This can make a huge difference for people booking in advance. MV Giamani has several itineraries, so please choose carefully from the list below to match your chosen trip. During the high season (Oct. - May) trips sail in the evening from Phuket's Chalong Pier. Guests who combine 2D2N (south) with 4D4N (Similan) trips can stay on board or spend a few hours in Phuket while the boat is restocked with provisions. Low-season trips also depart from Chalong, in the evening and depending on the trip length you will disembark in the afternoon or after breakfast on the final day. Engines. 2x NISSAN Engines Each With 230 HP. Electricity. All Cabins Complete With 220v Of Electricity 24 Hours Per Day. Nitrox. Nitrox Blending System Onboard. Dingies. Large Inflatable Dingy With 30 Bhp Outboard Motor. First Aid. Full Equipment Medic First Aid And Oxygen System. Water Capacity. Water Capacity: 10,000 Litres. Water Makers Water Makers 2x 4000 Litres Per Day. Entertainment Library, A/V System With Music Selection, DVD Player With A Library Of Films. 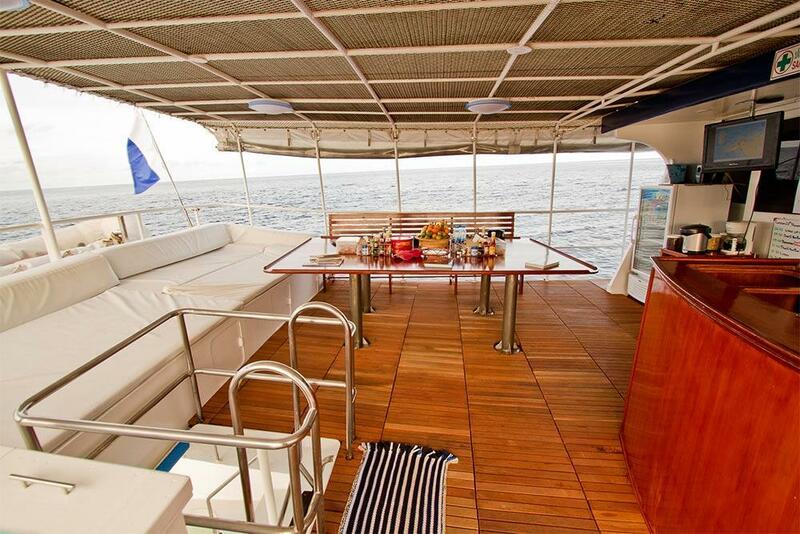 Scuba diving courses aboard MV Giamani can be booked and paid for before or during the liveaboard cruise. The advantage of booking in advance is that for regular courses, there is a discount and for less requested courses, the tour leader can plan the correct materials, instructor, equipment and even plan the trip accordingly. However, some people decide to take part in a course after boarding MV Giamani, and this is no problem in most cases. If there is a diving course that you are interested which is not listed below, please contact us for pricing and avaialability. With enough notice, almost anything is possible. Inexpensive transfers are available for Giamani's high-season trips. These usually cost $10/guest. For low-season trips there are free scheduled transfers from certain hotels and resorts in Phuket. For those outside of the pick up zone/time we can help to arrange safe, honest and competitively-priced private taxis to Chalong Pier, Phuket. Having a trip on the Giamani is not only having a trip on a fantastic boat but also a trip with a fantastic team !!! 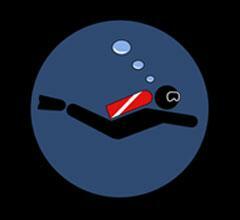 Everything has been perfect from a to z and of course the dive breathless !!!! million thanks for this unforgettable experience, please book me a cabin for next season :-) if you're not fully booked already ! Amazing service and experience! 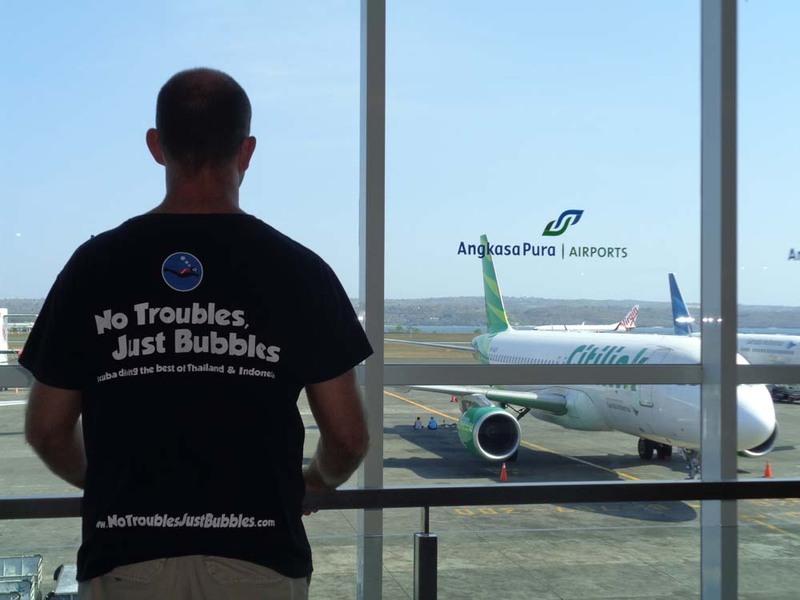 From booking through No Trouble Just Bubbles to Onboard the MV Giamani we were given service above and beyond! Cannot thank both teams enough for the once in a lifetime experience. You have certainly made our first liveaboard one we will remember forever. Thank you! A perfect organized boat with a great crew - as they told us: dive, sleep, eat....repeat! "Fun, personal luxury! Only 6 guests on the whole trip." The above prices are ‘per diver’ and include air-conditioned accommodation, meals, snacks & non-alcoholic drinks throughout the cruise. Non-diving guests receive a 10% discount on the cruise prices. Not included in the above prices are diving equipment rental (if required @ 800 THB / day), National Marine Park fees (1,800 THB / 1,000 THB) and some hotel transfers. The use of diving computer aboard MV Giamani is compulsory. For those who do not have their own, they are available to rent (300 THB / day).